The Anime Almanac » Blog Archive » Anime Almanac the Live! There will be no regular post this week because I’ve been hard at work at creating a new feature for the site – Anime Almanac the Live! No, I’m not putting on a concert… or starting a dorama adaptation… AA the Live is a Twitter aggregate for the anime blogging community. 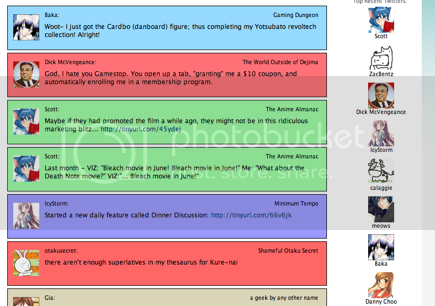 Users can visit the site to see what the Otakusphere is thinking about right now. It’s like a smaller version of Anime Nano, or an Anime Nano Nano, if you will. Twitter is a micro-blogging tool. The concept is simple – just post a small message that’s no more then 140 characters and it will show up on all your friend’s “Twitter feeds.” You can send updates via the website, cell phone text messages, AIM window, or any of the countless websites and applications built around the service. Its addictive simplicity has made Twitter one of the hottest new websites out there right now. Why Should the Otakusphere use Twitter and AA the Live? Because it’s makes it easy to get your word out onto the internets! There are times that you might need to say something, but don’t want to write an entire post on it. It doesn’t take more than 140 characters to say, “This week’s ToLOVEる freaking rocks!” every week, does it? Twitter allows you to say the little things without having to clutter your blog and RSS feeds with it, and AA the Live allows you to see everyone’s Twitter feed in one place. Another major benefit of Twitter is that it’s live and constantly updating. When there’s an event going on, like an anime convention, you know exactly what’s going on the moment that it happens. I used Twitter to send in live updates and photos from the NYCC last month via my iPhone. When Gia couldn’t get wifi in the panel rooms at ACEN last weekend, she sent in updates to her Twitter account with cell phone text messages. It’s my goal to have every anime blogger going to Otakon this year to have a Twitter account and to post their thoughts, reactions, and photos live from the convention floor. Thanks to Twitter and AA the Live, you won’t have to carry around a laptop to do live con coverage. How do I sign up for AA the Live? So hopefully Twitter and AA the Live will be just as addictive to you as it has been to myself in the past week. I’m already planning on adding some new features over the next few weeks, but first we need more feeds and more people updating. Twitter has always had a huge Japanese-speaking otaku community, so let’s get the English-speaking otaku community onto there as well. This entry was posted on Thursday, May 22nd, 2008 at 5:56 pm by Scott	.